Many children with learning problems show signs of auditory processing difficulties. These may present as auditory inattentiveness, lack of ready response to auditory input, poor auditory memory, problems with phonics or with spelling, or a speech and language delay or disorder. These are behaviours that can be readily identified in a classroom situation since this kind of auditory processing problem may be at the root of the difficulties of about 40% of children with learning difficulties, although the percentage is believed by some researchers to be as high as 80%. Learning problems are not the only symptom of poor auditory processing, but behaviour problems can also result, or hyperactivity, or an attention-deficit problem. (There are two excellent articles on this subject in J Katz, ed., Clinical Audiology). The essential concept with the auditory processing problems of children is the matter of the pre-linguistic processing of the auditory stimulus that appears to be inadequate. The hearing may or may not be impaired, there may be a hearing loss as well as a processing problem..There may be a processing problem in the absence of a hearing loss. Hearing loss and processing problems must be evaluated as separate issues, although they may be related. A percentage of children with poor auditory processing may show diminished or slow response to auditory input, but others may show a hyper-sensitivity to sound, – they may overreact to common noises, and be distressed by classroom sounds. They may cover their ears, or retreat from crowds. They may be aggressive, or have tantrums in shopping centres. Sometimes the “acts as if deaf” behaviour is a tuning-out of painful sound. FST practitioners will in some cases perform a listening exercise using a screening audiometer to determine what settings to use in the course of FST. IT IS EMPHASISED THAT THIS IS NOT A HEARING TEST, AND CANNOT BE INTERPRETED FOR THE STATUS OF THE PERSON’S HEARING. Should there be concern about the client’s hearing, they are referred to a suitably trained audiologist or medical practitioner. 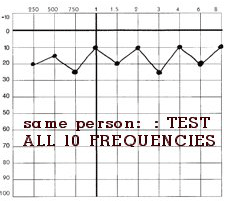 All ten frequencies must be tested in both ears, i.e. 250Hz, 500, 750, 1000, 1500, 2000, 3000, 4000, 6000 and 8000, and more if the audiometer will allow. It is essential to find the actual threshold for each frequency, where possible. Even test above 0 dB, to -10 dB if necessary. This is to identify one form of hyper-acute hearing. It is not sufficient to simply screen for hearing loss. 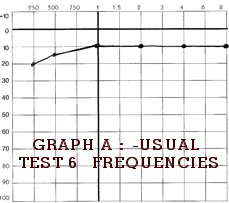 Please note that only a certificated FST practitioner may interpret the result of this hearing test FOR FST PURPOSES AND SUITABILITY.